Abel and Cain, the tragic story of an unaccepted brotherhood. After Adam and Eve left the Garden of Eden, they had two sons. They named the first born Cain, who became a farmer, and the second they named Abel, who was a shepherd. As time passed, Cain brought an offering from the field to the Lord and likewise Abel brought the firstborns of his flock. The Lord was not as happy with Cain’s offering as he was with Abel’s. Cain became angry over this and while they were in the fields, Cain killed his brother Abel. 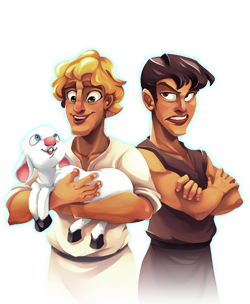 Abel and Cain had sibling rivalry ever since God favoured Abel’s gifts to His altar more than his brother’s, which had ended in tragedy. When the Lord saw what Cain had done, He cursed him such that the earth would never be fruitful for Cain. Cain became a “fugitive and vagabond” on the earth. But the Lord also placed a mark on Cain to prevent anyone from killing him. The Lord made a decree that anyone who killed Cain would see vengeance done to him seven times over. Cain went to live in Nod, east of Eden. Cain fathered a son with his wife. His name was Enoch. Cain built a city which he called Enoch after his son. Abel and Cain would have sired many sons and daughters and raised a happy and prosperous communities of peoples on Earth had they settled their disputes peacefully.